One of the classes I'm taking this term is Plant Nutrition. The lab experiments are the highlight of this course; we have five experiments going all at the same time, and each is exploring a different nutrition issue. The first one we began was a study of different homemade container medias, and we completed it yesterday. The findings were interesting and so I thought I'd share them. In my class we have six lab groups, each with between 3-6 people. My group started out with four of us, but now consists of only three students, and luckily we work well together. One student in my group is an engineer who is hoping to change careers; the other is a professional marijuana grower who hopes to own the first pot plant nursery in the Bay Area. I continue to be delighted by the variety of folks I'm getting to know and learn from! Before I get too far into this, let's talk about what the average person is looking for in a container media. The "soil" (this is in quotes because most container mixes do not contain any soil at all) needs to be strong enough to hold the plant up, it must have good water holding capacity and yet good drainage, it must have enough pore space to provide the plant with gas exchange in the root zone, and it would be nice if it had a little bit of nutrition, although since plants in pots do not have the usual microbial activity that those in the ground do, it is necessary to feed them regularly in some way. Most commercial potting mixes are made of different percentages of peat, vermiculite, perlite, and some sort of organic matter. All are heated to kill pathogens (and this sometimes kills the good stuff too). Many have added mycorrhizae (which is part of another experiment we are doing and is a subject for another time). Some have added synthetic 'slow release fertilizer' which frankly I believe you should stay away from, as many of these are incased in tiny plastic 'pearls' which are causing all kinds of problems in the ocean. Organic matter will provide a slow release of nutrients, and again, you'll be feeding them regularly anyway, so stay away from synthetic stuff. The seeds we planted (by luck of the draw) were Rainbow Chard. We made two four-inch pots for each media type (just in case one died). All were fed once weekly with fish emulsion. All were watered every day by the greenhouse misters. We made and tested three different media. #1 was a 'cactus mix,' made of equal parts scoria (volcanic rock), pumice, perlite, and sand. #2 was equal parts compost and fir bark. #3 was equal parts peat moss, perlite, and sand. Spoiler alert: None of the plants grew well. All of them got a terrible case of aphids. #2 compacted down to half the original size, which makes sense, because it was made up of all fine-pored stuff, which just keeps fitting together more and more with each watering. However #2 also had a first flush of great growth and was an early leader, because there was more nutrition in that media, but quickly succumbed to sodden roots. The one that did worst at the beginning was #1, because it had zero nutrition in the media. but it was also the one that did the best at the end, and that's clearly due to more air around the roots (big macropores). Water holding was not such a big deal because it was getting misted every day in the greenhouse. But, again, NONE looked like something I'd want to EAT. 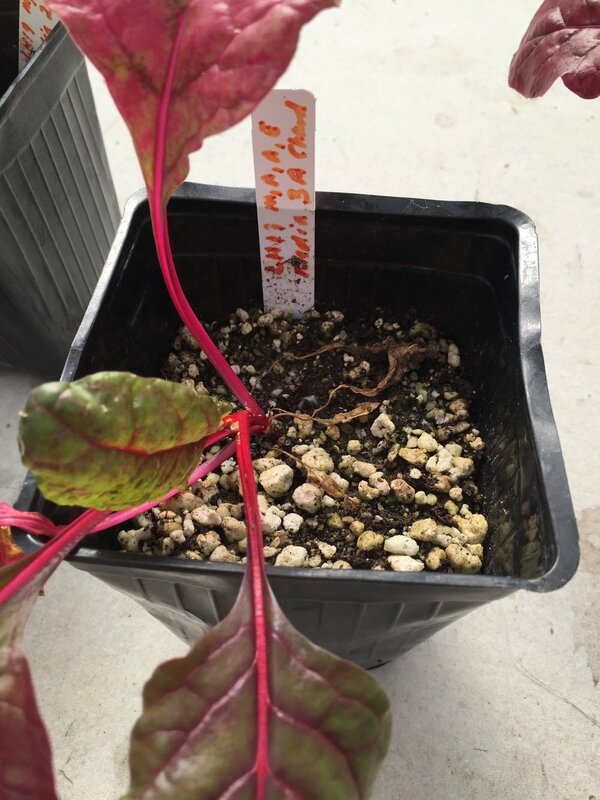 For comparison, here is a picture of a chard in another experiment, which was planted at the same time, in the customary potting mix the school uses for all greenhouse uses. This plant has great color, it's standing tall with good vigor and turgidity, it's bright and healthy with no mottling or chlorosis (only the seed leaf, or cotyledon, is looking a little tired, and that's because it's performed it's job), and the media is not compacted at all. Yesterday, the last day of this particular experiment, we took the plants out of the pots and washed off the roots to see what those roots systems looked like. This was super fun. The top two are #1's, the middle two are #2's, and the bottom two are #3's. One thing I didn't know: the roots of the chard have the same color as the chard stems. So if it's a red-stemmed chard, it has red roots! Since I never pull my entire plants up, rather cutting off the leaves and leaving the roots to rot in the ground, I never saw this before! The roots really completed the story for us. #2 and #3 both had shorter roots by far; they were also weaker, breaking when we touched them, and mushy with rot (too much water holding and not enough air). #1, the cactus mix, had the best roots, longer and very strong. These two also had a clear individual tap root, which developed at the beginning, going searching for nutrition. The weekly feedings helped this plant to do better than the others. Is the conclusion, then, to use only stones and rocks for potting? I don't think so. After all, you want something with a little nutrition in there. But I would certainly err on the side of MORE pore space than less. We forget, often, how important it is for the roots to have adequate oxygen. And oxygen is key! The only caveat is to make sure you're watering often enough, if you're adding a lot of big-pored items to your potting soil. Another caution - things like vermiculite and perlite (the most available additions which add pore space) will add larger pores to the mix, but do compress and break down over time. There is also some environmental cost to both of these items; research them further if you are concerned about that. Speaking of environmental cost, peat's is ENORMOUS, but it's in nearly every bagged soil, and there's a reason for that - it works great. It's hard to avoid it. What do I do? I generally don't make my own because I don't use enough to make it worth it. I buy organic brands that have composted organic matter mixed in; you can be sure that from now on I will make sure to check the pore space, and if it needs more, I'll add some chunkier gravel. Either way: most potted plants need a weekly feeding. Something organic, with very low nutrient levels, is the way to go.